Samsung has reportedly suspended production of its flagship Galaxy Note 7 smartphones. It comes after reports of replacement devices catching fire. Sources have not specified whether specific problems have been identified or when production was halted. The company says it is “adjusting” shipments of Note 7 to allow for inspections and stronger quality control and “rescheduling output”. There has been no comment on the reports of a production halt. Samsung says it is investigating reports of “heat damage issues” and says it will take immediate action to fix any problems, in line with measures approved by the US Consumer Product Safety Commission. Some retailers have suspended the sale or exchange of Note 7s. Major airlines also have banned passengers from using the phones. They say the devices should not be powered up or charged on board. Smoke from a replacement device forced the evacuation of a passenger plane in the US last week. Mobile carriers also took action on Monday. On September 2, Samsung announced a global recall of 2.5 million Note 7s, due to faulty batteries which had led to some of the phones catching fire. It ordered new batteries from another supplier and started shipping replacements to customers two weeks later. However, similar problems arose when a replacement Note 7 began smoking on board a flight in the US on October 5. 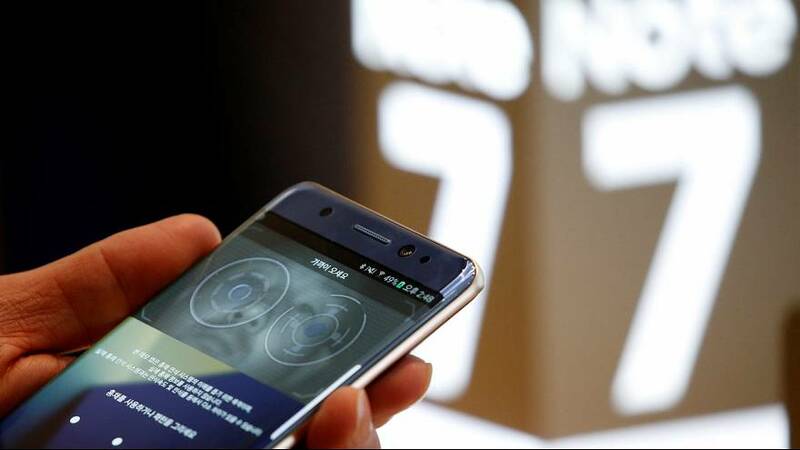 A South Korean government agency says it is monitoring the reports and has warned that the recalled Note 7 devices should not be used or charged inside aircraft. Fires in devices meant to replace those that have been recalled because of the risk of ignition would be a commercial disaster for Samsung, the world’s largest smartphone maker. Samsung shares rebounded after an initial sell-off on news of the recall. However, they closed down 1.5%, compared with a 0.2% rise for the broader market. The recall crisis has coincided with pressure from one of the world’s most aggressive hedge funds, Elliot Management, to split the company and pay out 27 bn dollars (24 bn euro) in a special dividend. “I think the cleanest thing to do is give up on the Note 7,” – HDC Asset Management fund manager Park Jung-hoon. “If the Note 7 is allowed to continue, it could lead to the single greatest act of brand self-destruction in the history of modern technology,” – Eric Schiffer, brand strategy expert at Reputation Management Consultants.